This topic contains 253 replies, has 3 voices, and was last updated by vaporl 1 day, 23 hours ago. The Aspire Cleito EXO Sub-Ohm Tank continues the storied heritage from the highly acclaimed Cleito family, integrating a modernized chassis with improved top airflow section while retaining the capable clapton-style Cleito Coil structure. Measuring 23.5mm in diameter, the new Cleito EXO features a sleeved tank section that increases the overall structural integrity while adding additional stylistic elements and eliminating leakage potential. The maximum juice capacity is 3.5 milliliter, filled via top-threaded system for convenient access. The Cleito Coil returns from the original Cleito Sub-Ohm Tank, implementing an elongated coil system which results in less restrictive airflow and increased flavor recreation, especially when paired with special “claptonized” coils. One key improvement lies within the new airflow system in which air channels will entire the structure through two top-airslots that redirects down the coil chamber, deploying auxiliary cooling properties and tremendous vapor production. The EOS II features the GX-180-UTC, a chipset that packs a punch and saves battery life. With the new chipset equipped, you can really personalize your device to your liking from changing the color of your screen, how to unlock your settings mode, setting your puff limit, and much more. The new software in the GX-180-UTC features our “swipe left to right or right to left to change firing modes”. We’ve also included a SOFT, NORMAL, and HARD firing modes. The EOS II is composed of beautiful stabilized wood, acrylic / resin on a lightweight aluminum frame to make a feather-like mode. There are 3 optional firmware files to cater to those who love the colored screen, or a basic and clean looking screen. The Base firmware that the EOS II comes with features our colorful screen that some of the community likes. Resistance range for their winding: 0.1 Ohm – 3.0 Ohm. The AsMODus Lustro 200W Mod is powered by dual 18650 batteries (sold separately) and features a touchscreen 23mm x 12mm OLED display system. Measuring 80mm x 40.5mm x 36mm, the Lustro Mod sports a rectangular shape with buffed sides and an ergonomic hand feel. Capable of achieving 200W output power. The advanced GX 200 HUT chipset features a wide range of control modes, including Temperature Control. A RGB LED light is located behind the fire button, on the bottom of the device, and on the side of the touchscreen display. OLED touchscreen is outfitted with a bright 5-line display and responsive touch adjustment features. “Swipe and Tap” touch controls for convenient handling. Speedometer-inspired screen. Geekvape Alpha Sub Ohm Tank Atomizer with resin application and adopts resin material looks fashionable and features special design. Geekvape Alpha Tank utilizes two different MeshMellow coil that can utilize the included 0.15 ohm mesh coil with an output range 60W to 110W and the best for 75W to 95W. An additional 0.4 ohm coil head is also included with an output range of 50 to 80W and a recommended range of 60 to 70W. Both of them can taste better and last longer with the purest flavor. The cotton of coils is from Egypt. The design of button press top, bottom airflow system and filling system are convenience refilling and bring present an astounding vaping experience. The all new Aspire Speeder 200w Box mod, brings aspires incredible build quality and high end finish to high powered box mods! All aspire products are exceptionally designed and manufactured and the Speeder box mod is no different! The Speeder has a myriad of features including temperature control, by pass mod, and customizable power settings. Speeder will go together with any of your favourite atomizers, this is a compact but heavy duty box mod that does not hold back! Get the most out of your builds with a quality box mod that will give you an exceptional vaping experience time after time! The KangerTech AKD K-Pin Kit is powered by a powerful internal 2000 mAh integrated battery,which ensures that you will be able to enjoy using your K-Pin throughout the day on a single charge. 2ml& 4ml tank capacity are for your choice.Kanger K-Pin with an intelligent LED battery level indicator shows the status of the battery life. Smoant Naboo 225W TC Box Mod comes with a compact and ergonomic design and adopts 2.4″ Colorful Screen to display parameters clearly and comes with touch button for easy operation. It is powered by dual 18650 batteries and supports power range from 1W to 225W. Featuring new Music mode, the scale will beat according to the volume of music, while vaping. On the side of the device, it has an independent locking button beside the fire button. You can locking and unlocking the screen freely. Balanced charging safety provides a safe vaing experience. 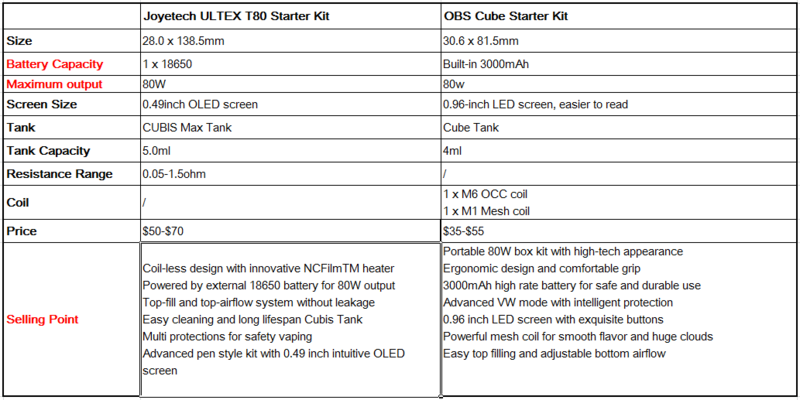 OBS Cube 80W Kit has a unique cube design and high-tech appearance that is safe and portable. It is powered by 3000mAh built-in battery and support maximum output up to 80W. It equips 0.96″ large OLED screen to display parameters clearly. Large fire button is very convenient to operate. Multiple protections ensure safety. The tank can hold 4.0ml e-juice and features adjustable bottom airflow system which will bring smooth flavor and huge clouds. Top filling design makes refill easier. Note: The coupon code “BANQ15” is still available to enjoy 15% off discount. Don’t miss the last few days discount. The SMOK Spirals Flavor Sub-Ohm Tank is a compact atomizer system creatively designed for flavor-enhanced output that utilizes the enlarged Spirals Coil Structure. Measuring 22mm in diameter, the Spirals Tank maintains a short stature while featuring a 2 milliliter juice capacity refill via threaded top-fill system that exposes two large fill ports. Quad adjustable bottom airslots provide ample airflow, while catering to a flavor-focused structure with an elongated drip tip. The Spirals Coil Structure is exceptionally large-sized, utilizing imported Japanese cotton with numerous wicking ports for rapid saturation. The atomizers induces a taste whirlwind experience, with the included 0.6ohm Spirals Coil featuring a wattage range of 18 to 35W with a recommended output of 18W. The package also includes a 0.3ohm Spirals Coil along with a single-coil RBA Coil Head for optional rebuildable capability. Featuring a 1.3 inch OLED color display and an easy-to-go interface, this compact EKEE mod is available in multiple attractive finishes. It can reach 80W max power, and feature 2A quick charge, real time lock, preheat and the new nicotine intake calculation. As for the ProCore Motor features the innovative flip type top-fill system and detachable design. It’s simplicity and modesty will satisfy you on daily basis. The Innokin CoolFire 4 TC100 Starter Kit is powered by the Ultra-fast advanced AETHON chipset with 100W of pure power with ClearWave noise cancellation technology. Real long lasting internal 3300mAh battery, the CoolFireIV TC100 is designed to be one of the top-of-the-line compact all day vapes, uses the Variable Temperature Control system with 100W output which includes Titanium, Nickel200, and Stainless Steel 316 in TC Mode. Combined with this incredible device is the iSub V tank, features top-filling 3mL capacity, the iSub’s dual adjustable airflow system supports wide airflow for deeper lung hits. If you prefer a tighter draw, simply turn the adjustable airflow ring to your exact preference and experience the perfect mouth-to-lung vape. The coupon code “BANQ15” is still available to enjoy 15% off discount. Don’t miss the last few days discount. Pavinno Puro Kit is a compact and delicate pod vape kit which is easy to carry, you can take anywhere you want to go. Powered by an integrated 18650 battery which allows for a 1450mAh capacity, two kinds of cartridges are available to insert into the top of the Pavinno Puro and can hold up to 2ml e-liquid with an easy refill method. Inside each pod, you can either install a 0.2ohm coil that fires in the range of 5 to 50 watts or you may use the 0.8ohm pod that fires in the range 5 to 20 watts. The latter coil may be used with nicotine salt juices or e-liquids with high nicotine concentration. Moreover, there’s a battery LED on the front of the device to know when it’s time to plug the unit in. To fire the unit, you take a puff and it will activate to fire in either temperature control mode or power mode that can be easily switched between. What’s more, Pavinno Puro pod vape Kit adopts new OTA firmware, you can also fine-tune via the Pavinno APP that connects to the device using Bluetooth 4.2 technology. Wotofo has collaborated with Mr.JustRight1 to bring you the Profile 24mm BF RDA. This new atomizer features an mesh coil compatible build deck, beehive style top cap airflow, and a spring loaded central ceramic support platform. The Wotofo Profile 24mm BF RDA has a wide clamp style dual post build deck that has accommodates both mesh style coil sheets and regular performance coils. This package comes with two Wotofo Mesh Style Coils 16mm by 6.8mm sheets that have an atomizer resistance of 0.18 ohm, and a recommended wattage of 40 to 60W. These mesh strips can be perfectly shaped to fit the Profile’s build deck using the included mesh bending tool. The Profile aims to solve the cotton wicking issue with most mesh RDA’s with the use of a spring loaded ceramic support deck. The bottom feed pin also directly sends e-liquid to the top of the ceramic support deck, directly wicking cotton when using a mesh coil.The top cap on the Wotofo Profile has 19 1mm air holes per side, aligned with the deck to provide optimum airflow. The Profile BF RDA comes with a bottom fed gold plated 510 pin, and a standard gold plated 510 connection. The collaboration between Wotofo and Mr.JustRight1 created the Profile 24mm BF RDA; an excellent and unique rebuildable atomizer that is simple to build and amazing to vape. Hellvape Drop Dead RDA Atomizer is co-designed by Heathen, The Vapor Chronicles(TVC) and Hellvape. With 24mm diameter, it has four large post holes for simple building of both single coil and dual coils. With larger space, you have more ways to install the coil. It’s up to you! Drop Dead is designed with innovative downward sloping airflow, and you can find 14 airflow holes in two rows to bring you extremely smooth and tasty vaping. You can accurately adjust the airflow to the tightest condition, or the widest one, thus it’s a great choice for DIY lovers. It comes with deep juice well, and standard positive pin and raised BF squonk 510 pin are included. Pre-installed with colorful resin drip tip, there is another black 810 drip tip for replacement. Consisting of powerful ULTEX T80 Battery and Cubis Max Tank, the Joyetech ULTEX T80 Kit with Cubis Max is a compact and elegant TC kit with 0.49 inch intuitive OLED screen and mechanical style & ergonomic construction. Powered by single 18650 cells with multiple protections, the ULTEX T80 fires up to 80W max output with high performance VW/TC/Bypass modes. What’s more, the Cubis Max tank adopts the innovative NCFilmTM heater system which takes a horizontal building way and a larger heating area for the excellent vapor production and the optimal flavor. Perfectly compatible with the brand-new 5ml Cubis Max tank which features easy top filling and top airflow system without leakage, the ULTEX T80 Kit will bring you an enjoyable and reliable vape experience.